A routing number is also called routing transit number (RTN). It is a nine digit bank code, used in the United States, which checks the financial institution on which it was drawn. This code helps to facilitate the sorting, bundling, and shipment of paper checks back to the drawer's (check writer's) account. Most common types of transaction being ACH and wire transfers. Some banks and credit unions may have multiple routing numbers serving different purposes, geographical regions or branches. Routing numbers are printed on the bottom of a check. They can also be found on online banking sites of the financial institution. The Routing number is also used by Federal Reserve Banks to process Fedwire funds transfers, and by the Automated Clearing House to process direct deposits, bill payments, and other such automated transfers. ABA Routing Number: Routing numbers are also referred to as "Check Routing Numbers", "ABA Numbers", or "Routing Transit Numbers" (RTN). The ABA routing number is a 9-digit identification number assigned to financial institutions by The American Bankers Association (ABA). This number identifies the financial institution upon which a payment is drawn. Routing numbers may differ depending on where your account was opened and the type of transaction made. 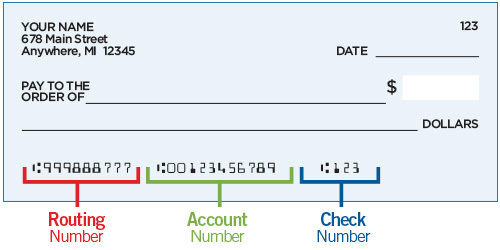 Each routing number is unique to a particular bank, large banks may have more than one routing number for different area. Know More..